Push-up pops are perfect for themed children’s parties as well as spooky Halloween parties, summer picnics, Easter gatherings, Valentine’s Day occasions, tea parties, baby showers, bridal showers, and more. Push-up pops are reminiscent of those frozen push-up pops from childhood. There are no rules this time and these amazing treats can range from frozen novelties to cakes and pies, and in fact almost any dessert recipe can be transformed to fit in these readily-available little dishwasher-safe containers. Tips include using a jelly roll pan (a cookie sheet with a raised side on all four sides) for cakes, cookies, and bar recipes. Use one of the push-up pop containers as a cookie-cutter and your treat ingredients will readily fit into the container. Preheat oven to 350° F. Melt 1⁄2 cup of the butter and combine with pound cake mix and 2 eggs. Mix with an electric mixer until ingredients are well blended. Spread into a greased jelly roll pan. Set aside. Melt the remaining 1⁄4 cup butter. Soften the cream cheese in a microwave-safe bowl. Beat the cream cheese, remaining 2 eggs, powdered sugar, melted butter, and vanilla with an electric mixer until fluffy, 3 to 5 minutes. Pour over cake mixture in pan, sealing the edges. Bake for 45 minutes or until golden brown. Cool and cut into circles using the open end of a push-up pop mold. Slice the strawberries or cut into small pieces. Start layering a push-pop mold with a circle of cake followed by a dollop of whipped cream topping. Add a layer of strawberries. Repeat layers. 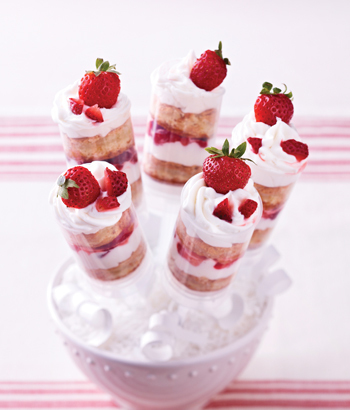 Garnish the top with strawberries. Chill until ready to serve. Makes 12 push-up pops. Combine the softened lemon and raspberry sorbets in a medium mixing bowl. Add the champagne and lemon zest. Stir until well blended and place in freezer for at least 1 hour. 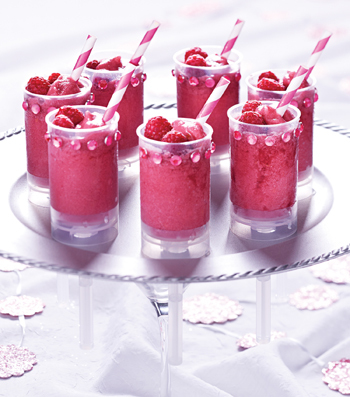 After it is frozen, spoon champagne freeze into the push-up pop molds. Place the tops on and place molds in the freezer until ready to serve. Garnish with fresh raspberries before serving. Makes 12 push-up pops. Melt the chocolates and butter in a heavy saucepan over medium to low heat, stirring constantly. Remove from the stove and stir in the cream, powdered sugar, vanilla and almond extracts, and salt. Cool slightly (15 to 20 minutes). This makes a chocolate truffle mixture. Place Heath English Toffee Bitsz® in a shallow dish. 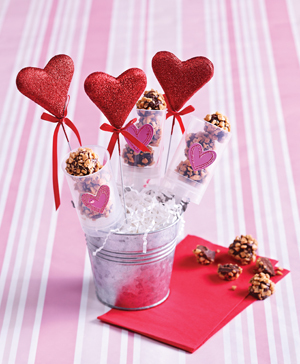 Shape chocolate truffle mixture into 1-inch balls and roll them in toffee bits. Store truffles in an airtight container in the refrigerator. To make push-up pops, layer 3 truffles in each push-up pop container. You can add a dollop of chocolate frosting between each truffle, if desired. Makes 8 push-up pops. To make hot fudge sauce, mix the chocolate, sugar, and evaporated milk in a double boiler and heat until melted and smooth. Stir in the butter and vanilla until blended and heated through. Place 28 Oreo™ cookies in a ziplock bag. Seal bag and crush cookies using a rolling pin until they are in very small pieces. Mix the cookie pieces with the melted butter. To assemble push-up pops, layer 1 to 2 tablespoons of cookie pieces into the bottom of a push-up pop mold. Add 1 tablespoon of coffee ice cream. Top that with 1 tablespoon of fudge sauce. Repeat layers until full. Freeze push-up pops until ready to serve. When ready to serve, remove the tops and let soften a few minutes. Cut pirouette cookies in half and stick two half-cookie sticks in the top of each push-up pop and serve. Refrigerate leftover fudge sauce for use with other ice cream treats. Make 12 push-up pops.. Growing up in the South, Courtney Dial Whitmore attended Vanderbilt University earning a bachelors in communications and a masters in organizational leadership. The recipes above are from her book Push-up Pops, released in 2012. Her expertise has been featured on HGTV.com, Ladies Home Journal, AOL’s DIY Life, Get Married Magazine, MarthaStewart.com, and more! She writes for Disney, The Huffington Post, SHE KNOWS, Hostess With the Mostess, and Tablespoon. Whitmore resides in Nashville with her husband and springer spaniel puppy, Henry. For information visit www.pushuppops.com.